Google maps sent me back to Cape May via a different route and I did not again pass the one gas station that appeared to be open for business. Concerned though that the Jetty Motel’s office would close for the night before I had checked in, I headed straight there, passing several closed gas stations along the way. Not looking good in the refueling department. I arrived just in time, moments before the front desk closed, and was helped tremendously by the receptionist. She pointed me in the direction of the one and only gas station open and provided great advice for dinner, The Lobster House, located on Schellengers Landing Road, Fisherman’s Wharf at Cape May. My dinner of chowder and oysters was fabulous! I met a super nice guy at the bar and he shared lots of information about the area. He is marine biologist on one of the local whale boats, which is actually a schooner! He was headed the next morning to the Keys to help a friend rebuild his campgrounds. The Lobster House is open seven days a week, all year round, and includes several restaurants, a coffee shop-lunch counter style diner, fish market, and dining on the Schooner American, which is moored dockside. The commercial fishing fleet at the Lobster House offloads millions of pounds of seafood and supplies much of the fresh seafood on the Lobster House menu. The following morning I had checked out by daybreak, filled with anticipation to return to Stone Harbor Point to see the Monarchs departing the trees at first light. First though I headed to the beach across from the hotel for a very quick glimpse. 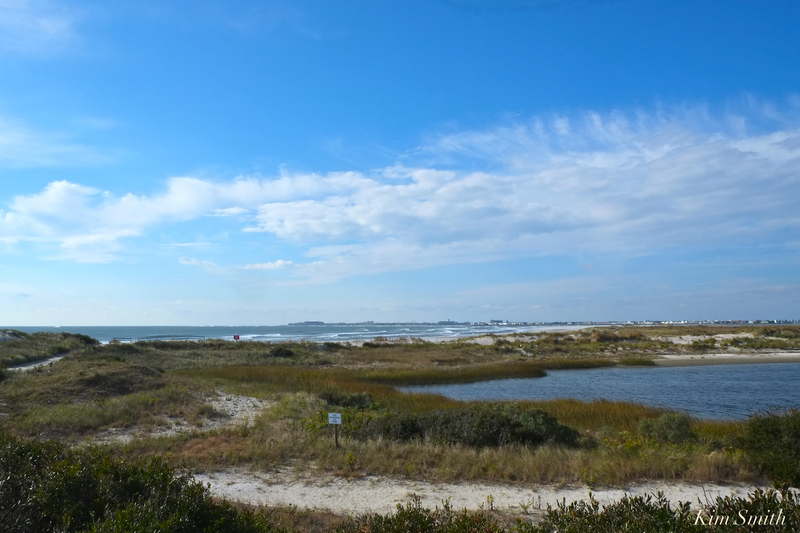 The wide sandy beach has a perfect view of the Cape May Lighthouse. 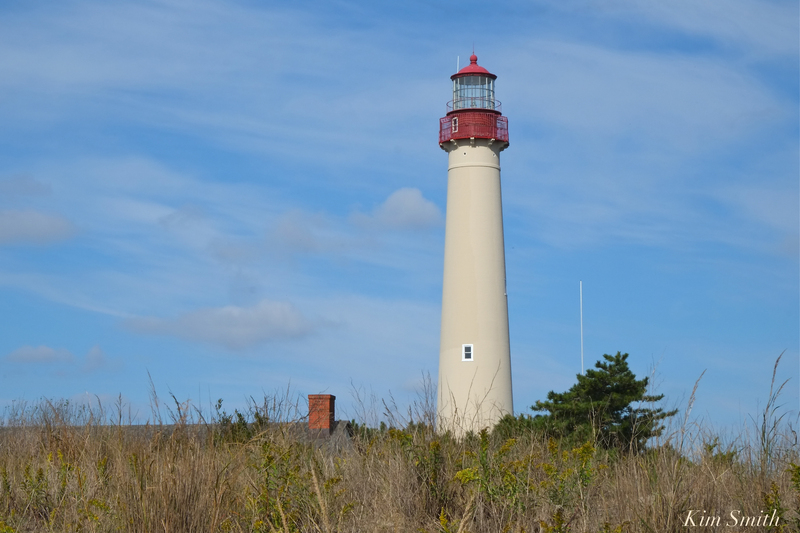 You can walk along the beach and through the trails of the Cape May State Park for direct access to the Lighthouse. At the shoreline were poised to cross the Bay a great flock of Black Skimmers. Overnight the wind had picked up tremendously and the flock were aligned in perfect soldier-like order, all facing into the strong gusts. Oh how I wished I could have spent more time there exploring this area so rich in fabulous creatures and wildlife. Most definitely on my next visit! Notice the amazing lower mandible of the Black Skimmer. While flying, the Skimmers use their bill to skim small fish along the surface of the water. 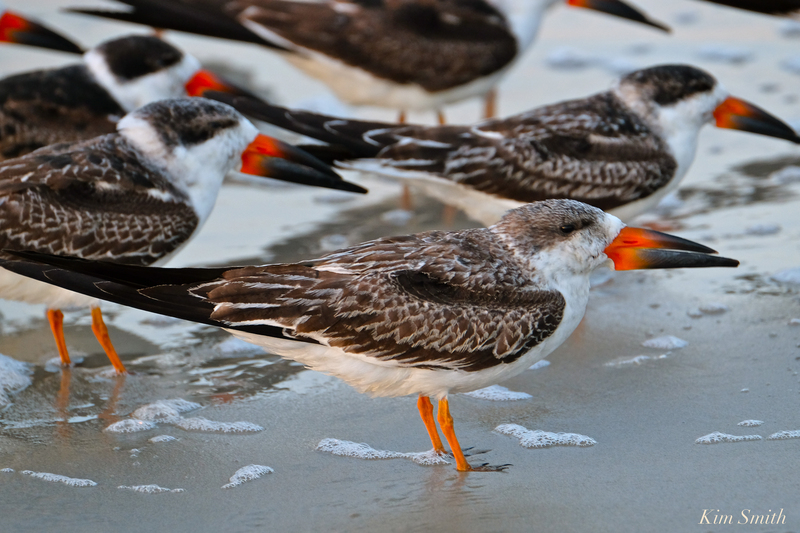 The Skimmers pictured here are mostly young Black Skimmers in plumage mottled brown and white. 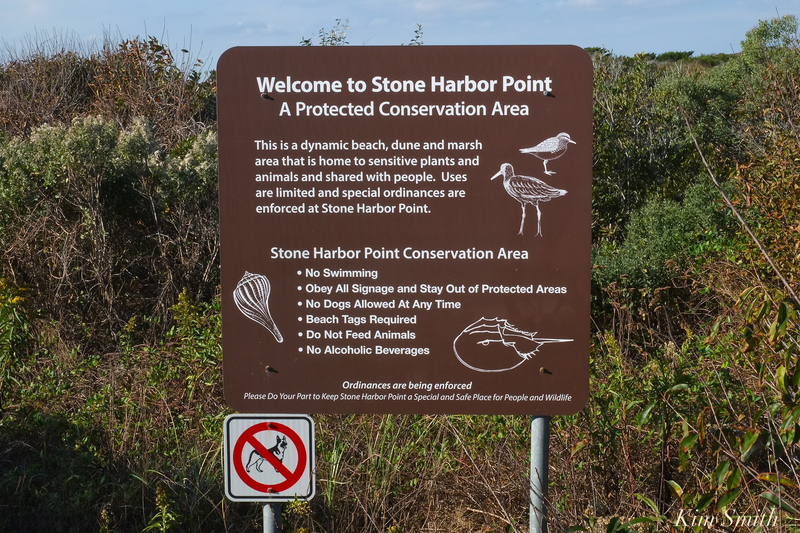 I arrived at Stone Point Harbor just as the butterflies were awakening. 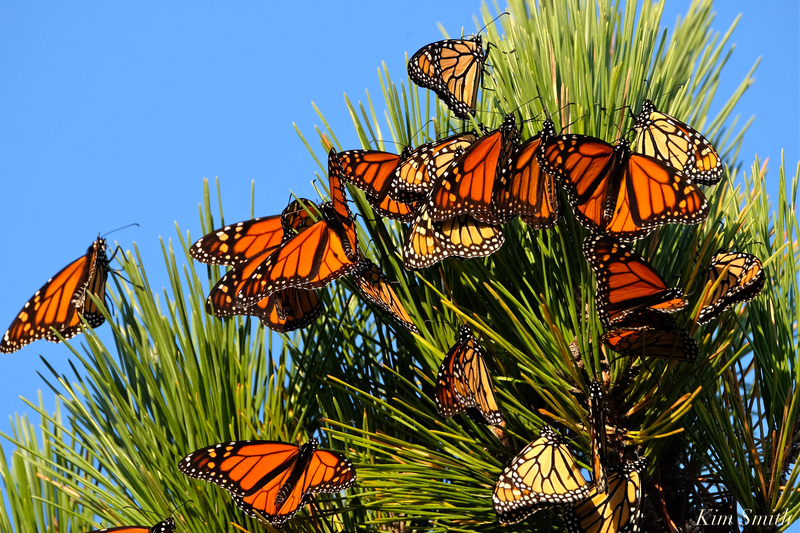 When butterflies roost in trees, they will often situate themselves so that the eastern light of the early morning sun rays warm their wings. They will also typically (but not always) choose overnight sleeping areas that are out of the way of the of the prevailing winds. 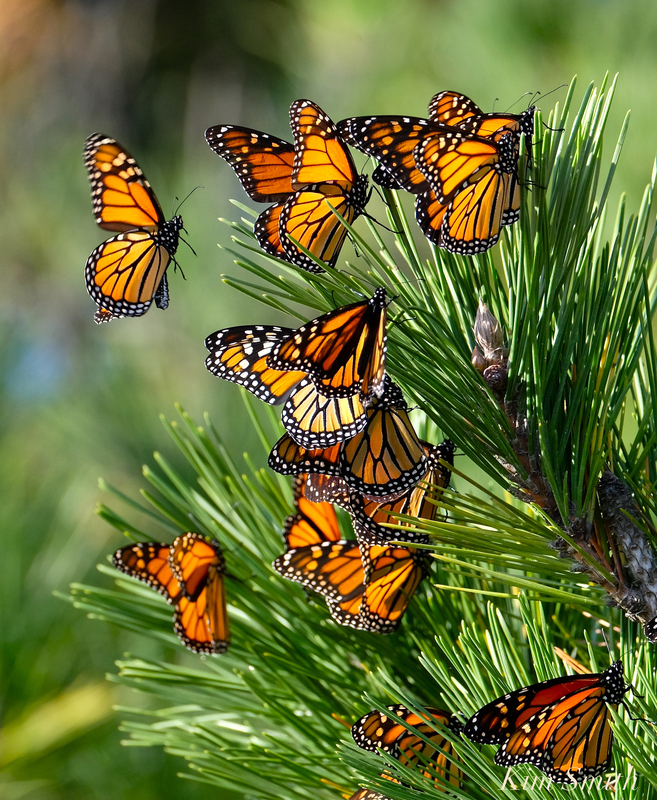 Because of the strong wind, instead of leaving the trees all at once, as I have often observed, the Monarchs would take off, have difficulty navigating the wind, and then return to the trees. 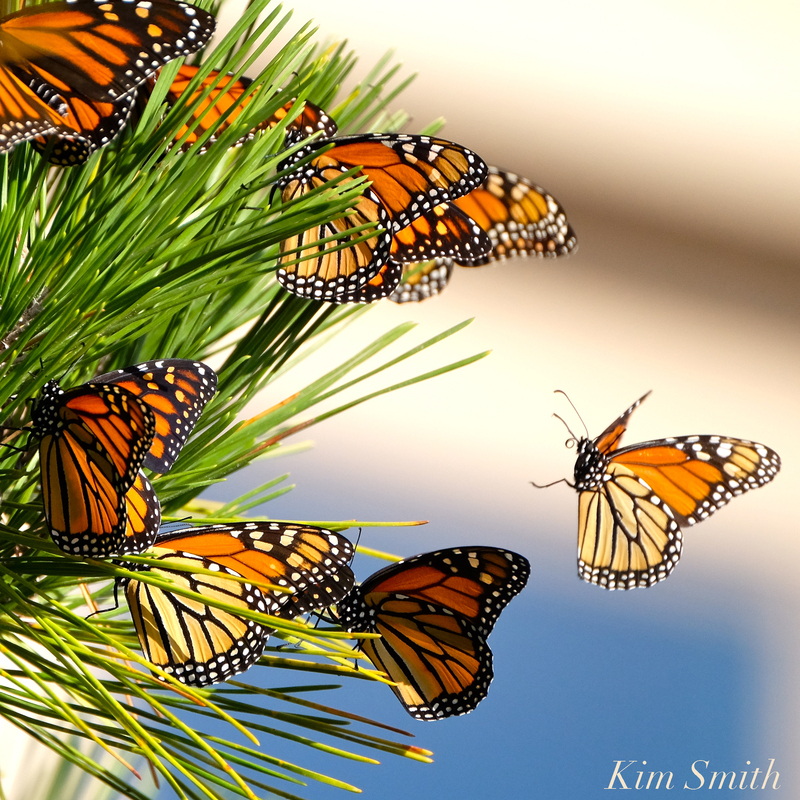 These attempts lasted several hours as the Monarchs tried again and again to negotiate the harsh wind. In the mean time, the Monarchs that weren’t as intuitive as the ones that were roosting in trees had roosted overnight on the dried out stalks of wildflowers. They were having an extremely tough time, clinging with all their might to the stalks or getting pulled down to the sand. This was challenging to observe as there was nothing that could be done to help the butterflies expending so much energy to stay grounded. Time was spent between the trees and the dunes. After several hours there were still a number of butterflies warming in the trees, barberry bushes, and wildflowers when I had to leave Stone Harbor Point to return to Cape May Point to investigate any migrating butterflies that may have been there. 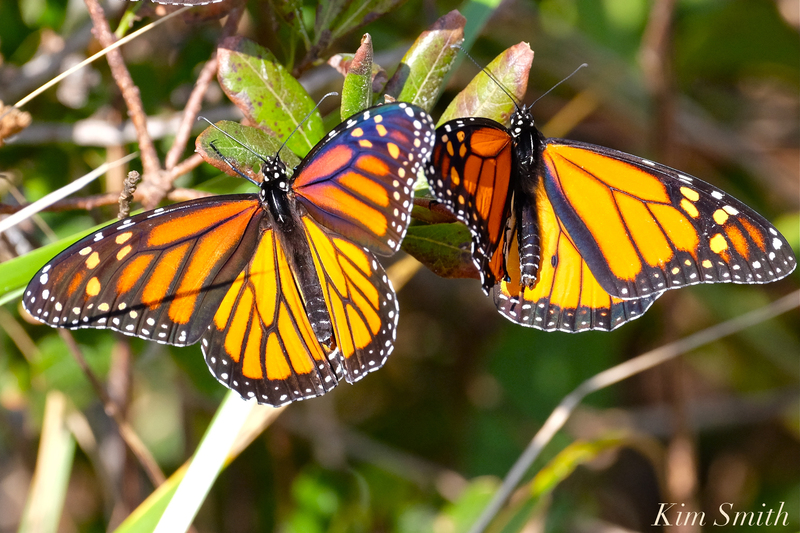 Female (left) and Male Monarch Butterfly warming their wings on a barberry bush. 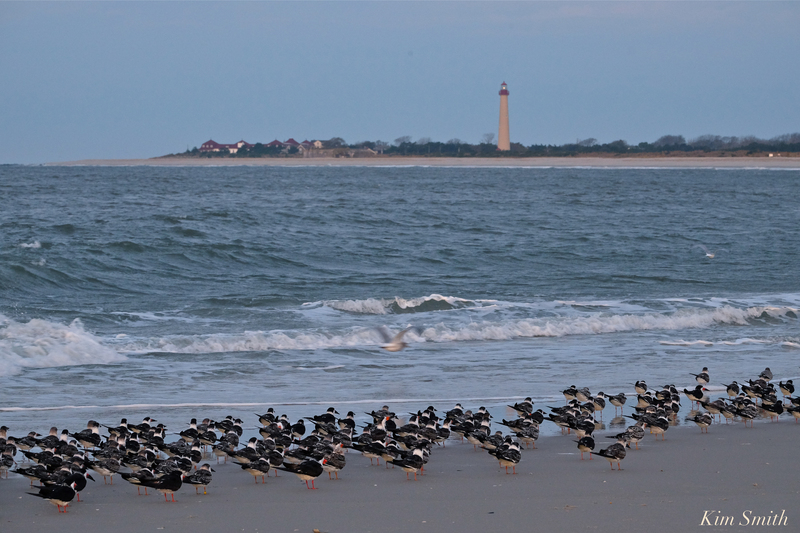 None were roosting at the Cape May Lighthouse and few were on the wing. With the wind blowing in precisely the opposite direction for safe travel across the Delaware Bay, the Monarchs were waiting yet another day to take the next leg of their journey. Looking towards a nine hour drive ahead of me, I couldn’t stay a moment longer. Except to grab a bowl of chowder at the Lobster House and have a quick glimpse in the daylight hours at the Fisherman’s Wharf at Cape May. Sea Bass fishing season was open and fisherman Jim is cutting up squid for bass bait. 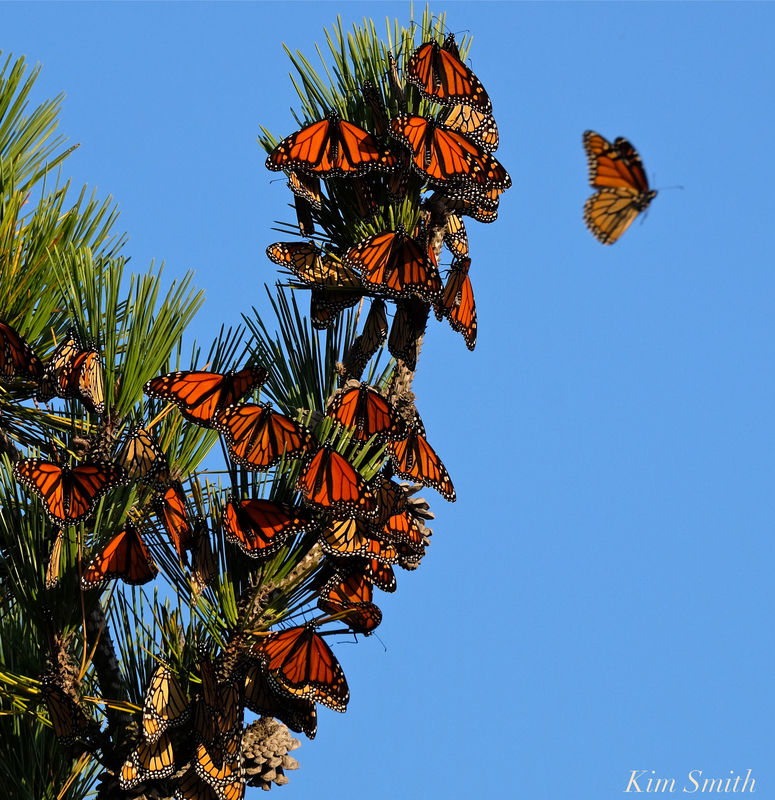 Monarchs began arriving in Angangueo several days ago. And in much greater numbers than have been seen in recent years. Barring any huge weather events, this late, great batch of migrants will make it too. Friends are reporting that there are Monarchs in their gardens still, and I have one of Patti Papows caterpillars in its chrysalis, yet to emerge. Eggs, caterpillars, chrysalides, and butterflies that would have been killed by more seasonable colder temperatures are able to survive in the unusually warm weather we are experiencing on the East Coast. However, most of the wildflowers that provide fortification to the Monarchs on their southward journey have withered. You can help late stragglers by keeping nectar producing flowers in your garden going as long as possible. In our garden, it is the old passalong Korean Daisy that is providing nectar to bees and butterflies, and it will bloom until the first hard frost. This entry was posted in Lepidoptera, Monarch Butterfly, Monarch Butterfly Film and tagged Barberry, Black Skimmers, Cape Ann, Cape May, Cape May Lighthouse, Cape May Point, Danaus plexippus, female and male Monarch BUtterfly, Japanese Black Pine, Monarch Butterfly Migration, New Jersey shore, Pinus thunbergii, Rynchops niger, Seaside Goldenrod, Stone Harbor, Stone Harbor Point on November 4, 2017 by Kim Smith.